From the South end of 4 mile beach to the Surf club at the North end. The wind was blowing at last in the morning. 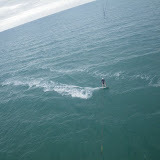 After a few upwind tacks it dropped a little so I decided to go for a downwinder while the going was good. Great fast runs with some excellent carving on the small swell. Good speed and a few jumps. Dodged the "wind hole" half way along the beach. Landed about 100m before the jellyfish net swimming area. Coffee and a rest at the cafe, then walked into town and caught the bus back. Stoked. The wind picked up again on my return so I headed out again. It dropped off as I headed out so I went downwind again. Less wind and speed this time. I did quite a few kiteloops in both directions to keep powered up. Landed about 500m from the surf club. Realauched the kite a couple of times using the front lines with the kite on its trailing edge (low wind relaunch) but not enough power to get going. Walked to the surf club then out to the road. Fabian, a fellow kiter (a Columbian who lives in Port Douglas and works on Quicksilver) gave me a lift right back to 4 mile. The wind was still light. Brett and Al took out the new 17m Zephyr. I gave it a go late too late in the day. It turns very well and flies similar to my Switchblade 14m and has a little more power. A low pressure cell has settled down south and is disrupting the SE trade winds in Far North Queensland. However, this means sunny days and clear skies, so I did a fantastic bike ride to Cape Tribulation and back today. Riding through the rainforest is superb and its a stiff climb over the Alexandria range. I dunked my legs in the sea at the Cape Tribulation beach, then returned for a nice lunch at the Thornton Beach cafe before cycling back to Port Douglas (in about 3.5 hours). There are many things to do in Port Douglas when the wind is not blowing - such as cycling, reef trips, walks and day tours. But I would rather be kitesurfing! The four flavoured icecream from the Daintree Icecream Company was superb too - blueberry, wattleseed (like coffee), passionfruit and soursob. All made locally without chemicals. The Daintree is a very special place, and on this occasion was not overrun by cars and tourists, It is well worth a visit. Now I just need to kitesurf along the coast - giving the mouth of the Daintree River a very wide berth. Good wind blew up during the afternoon. I headed oiut at 3:30 and kited for over an hour. 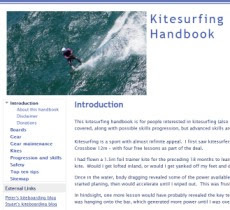 There were about 10 other kiters out in the warm water and fine weather. I took out the 14 - it was well powered. I decided to kite upwind through the reef to get some flatter water. Two other kiters were having fun. One of them was Juoko - a Port Douglas winter regular. Nice flat water behind the reef and some small surf near the shore. It is a great area to practice and play. I did some kite-down turns successfully, and stuffed a couple up. On one occasion I lost my board and was glad I was wearing some reef socks as I walked back to get it over the uneven shallow reef. I saw a couple of sea turtles duck under as I passed by. I got some big jumps in too - some landed nicely. A great session to get back onto tropical waters. The breeze picked up for the last half hour by another 5 knots. Got my gear washed and stowed on the grassy rigging spot. No beach shack this year though - looks like the Council has had it removed.